A sunny day to look for flowers, rocks and sticks! I'm sorry I didn't get to this more quickly! We have had a very busy week. It's been good, but BUSY! 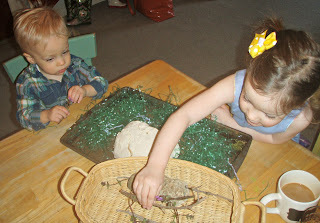 We made our Easter mountain, and tonight we attended our church's Maundy Thursday service (a highlight in my year!). I will not take time now to repeat detailed descriptions on our Easter mountain, but just put up a few pictures I have taken as well as the link to where I wrote about this in the past. But before Good Friday is here, I wanted to share my plan for a special Good Friday lunch we are going to have tomorrow. I have been trying to think of a way to make Good Friday special with a meal. We are not often at home on Good Friday, because we tend to travel to visit family on Easter, but this year we are here, and I wanted to do something meaningful, as well as invite some friends to do it with us! So here is what I came up with -- it's not amazingly original, but amazingly simple. I want to set the table using real china, silver and goblets, and as a centerpiece put our Easter mountain as well as a small wood cross and a red rose. As we talk about Jesus dying for our sins, I will let the kids help me rip off the petals and attach them to the cross with push pins, so we can visibly see something beautiful and perfect be destroyed like Jesus was. I got this idea from Jessalyn at Desiring Virtue, and you can read her post and see her beautiful pictures here. For food, I will set a large tray with the following: slices of cheese, cut into a cross shape, olives (for the mount of Olives where Jesus prayed), carrots cut in points like thorns, matzo bread (which shows stripes and piercings illustration how Jesus was hurt -- also, we break it, as Jesus' body was broken), grape juice (which reminds us of his blood poured out), small tomatoes (which remind us of the stone -- you could use anything round) and a lamb cake (which reminds us of the spotless Lamb who was slain). My thinking in making it all on a tray is that it will prevent small kids from complaining about what food they don't like, and instead focus on the descriptions. 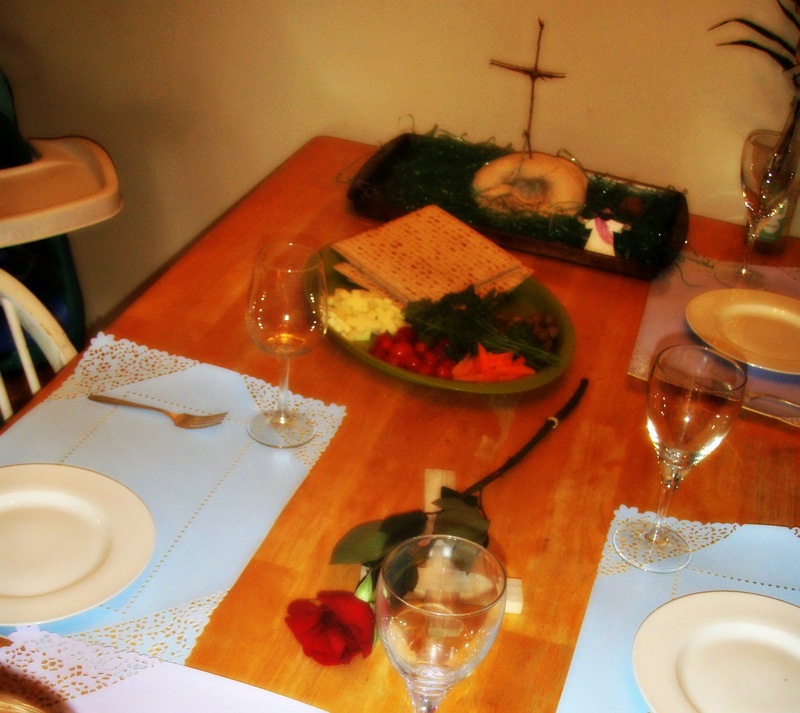 I also thought of adding some elements of a Passover Seder like parsely and salt water, but we'll see if I get to that! I don't plan to read a TON to the kids, but just show them the food, and pray a serious prayer of thanksgiving and maybe read one good book to them while they eat. We are also planning to let the kids make Resurrection rolls after we eat. Hopefully my ideas (borrowed from other people mostly) will inspire you to have good conversations with your kids on Good Friday! If all goes well, I will take some pictures to add to this post! Kids eating the food -- not sure if anyone but Susie actually liked what they ate, but nobody complained. 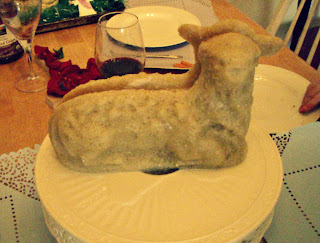 Lamb cake for dessert -- will not win me any awards but my kids thought it was awesome. Ellie, rolling her marshmallow. I was impressed, she is only 2 and she did a great job! Here are some pictures of our Good Friday lunch today! The final part of "making Easter a big deal for your kids" is traditions. Now from the outset, let me just say a word about "the search". You can find amazing ideas on blogs and Pinterest all day long. I love to search and "pin" ideas of cute Easter crafts and desserts, etc. But at some point, the search needs to end, and you need to just make your traditions your own. Sometimes searching so much can rob me of the joy of practicing the traditions, because in my mind I see the pinboard with all the ideas I didn't get to. Or I think about how amazing other moms are and how they are doing more than me and then I feel guilty or depressed. 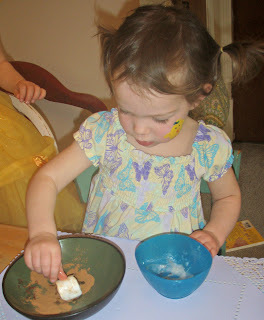 Let me just keep it real here -- there are some days that our house sits rather messy and supper gets just thrown together because I am doing crafts with my kids. Or my kids have fight about whose day it is to put on the paper chain link or open the egg in the chicken (more about those in a minute). In many ways, these traditions are for ME right now as much as them, because I am the one who knows Christ and who is encouraged to think of his great love for me when I see the cross. But someday I hope the traditions will mean quite a lot to my children as well. 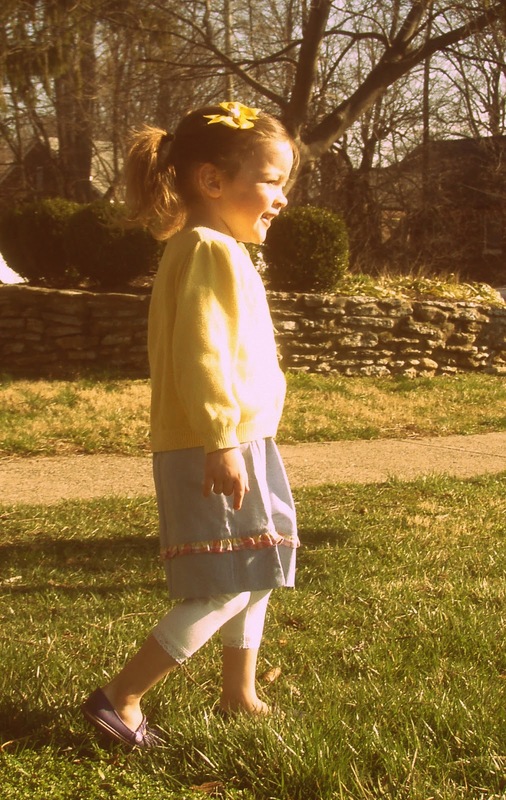 A new tradition I'm starting this year is hanging tags on our new Easter clothes -- I really love this idea from Jessalyn at Desiring Virtue (which is also where I got the free printable). I have always done new outfits for my kids (and sometimes the grown ups in our family as well) at Easter. But I have never had a real reason for it -- but here is a wonderful way to redeem our new attire. When we dress in fresh new clothes (or homemade clothes, or new-to-you hand me downs), we can feel fresh and new ourselves! Instead of glorying in our appearance, we can remind ourselves that Christ dresses us in our new self in Him "after the image of the Creator" and one day he will dress us in a new robe that will not fade away. I think this is a tradition that will grow with us -- it will be especially helpful when my kids get bigger and may be tempted to be proud of their appearance. It is helpful for me NOW when I am proud of my kids' appearance! As beautiful as they are in darling fresh Easter outfits, that is just a tiny tiny picture of the glory that is waiting when we are dressed in Christ's righteousness! 1. 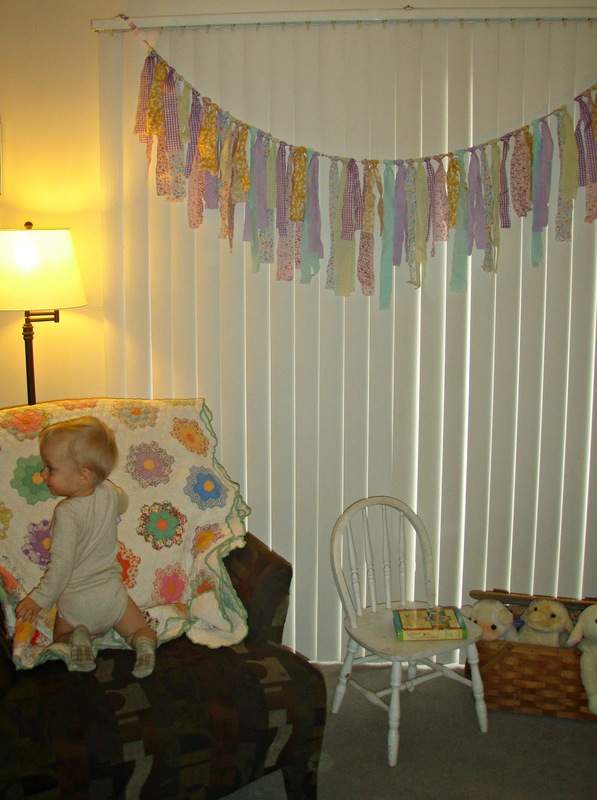 Countdown to Easter -- I had an "aha" moment last year that I wrote about on this blog about how to count down to Easter by making a paper chain. This year I cut 31 paper strips and taped one to hang from each day on Susie's calendar and the paper chain we have made is hanging from the kids' bedroom door. I have mentioned multiple times how it keeps getting longer like our sins keep getting more and more. I think my kids are going to get REALLY excited about ripping up the paper chain on Easter morning! 2. Easter tree/Resurrection eggs -- last year I put an egg in our glass chicken each morning for Susie to find when she woke up. These eggs were a version of Resurrection eggs that I attached little ribbons to for us to hang on our "Easter Tree". Susie has gotten REALLY excited about this again this year and can explain the symbols herself (except the coin, that one tripped her up). I like to hide puzzle pieces in eggs and have the kids hunt for them and then put together the puzzle. I found small, easy puzzles on Oriental Trading that fit in the jumbo sized eggs well. We enjoyed this activity last week with our neighbors, who are new to America, and have never before celebrated Easter -- I was glad I had thought through our traditions so I could explain Easter to her a little bit that day! If I just had said "we do this egg and bunny thing. . . but . . . it's really about Jesus" it would just make no sense! Instead I shared that eggs are a symbol of life and we celebrate that Jesus is alive at Easter. She was interested and surprised that Chip recognized the picture of Jesus on the puzzle and shouted "Jesus!" when it was completed! There are no end to the cute craft ideas out there! I personally like to skip bunny stuff and most other spring-only type things to focus more on the cross. My kids do have a collection of stuffed lambs, and I think lambs are a very appropriate animal to make crafts about (especially if you take time to learn about Jesus being our Shepherd, the Passover, etc). Here are a couple adorable lamb crafts I found and may or may not create with my kids. We have colored lots of pictures, done some paintings, and made Easter cards and bookmarks to share with friends. I'm posting links to some of my favorite coloring/painting pages. 4. Treats -- We sent an Easter care package to my sister who is in college and made a version of this treat. It was perfect because the kids could help me make it, it was light to travel, and since I omitted the M&Ms, it was chocolate free (we try to use only fair trade chocolate, and make it rare and special). 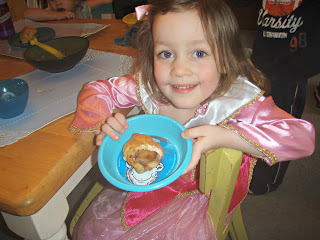 We also like to make these Resurrection rolls with marshmallows, cinnamon and crescent rolls. Making treats to share for Easter gives us an opportunity to share our love for Jesus! On a more every day level -- I have a small cross cookie cutter that I like to pull out from time to time and cut small cross shapes in my kids' pancakes, sandwiches or whatever just to make it a little bit special. Tomorrow I will post about our Holy Week traditions -- our Easter mountain, Maundy Thursday, Good Friday and Easter Sunday. Enjoy a blessed Palm Sunday looking forward to the return of the King! Susie at lunch -- looks like I felt extra Easter-ish that day! My kids can sing Christmas carols all the live long day, mainly because I love to sing and listen to them during the Christmas season. Chip could barely talk at Christmas but that didn't keep him from singing Silent Night and Away in a Manger from dawn til dusk during Advent (and a good while after Christmas too!). However, it is not habitual for to me to swing into Lent and Holy Week and Easter singing good Easter songs (until Resurrection Sunday of course!) unless I really focus on it and try. There are so many beautiful hymns and Christ-centered songs that I want my kids to learn and they won't unless we teach them! So let me share a few of our favorites. For very little children, I like teaching simple songs and choruses with hand motions. So we sing The Gospel Song by Sovereign Grace and Easter Friday by Emu Music (the link will take you to the CD J is for Jesus and you can listen to Easter Friday). Both my children have learned these songs before they were two (and a funny note -- they both called the song Easter Friday, "Jesus", as in "I want sing Jesus"). 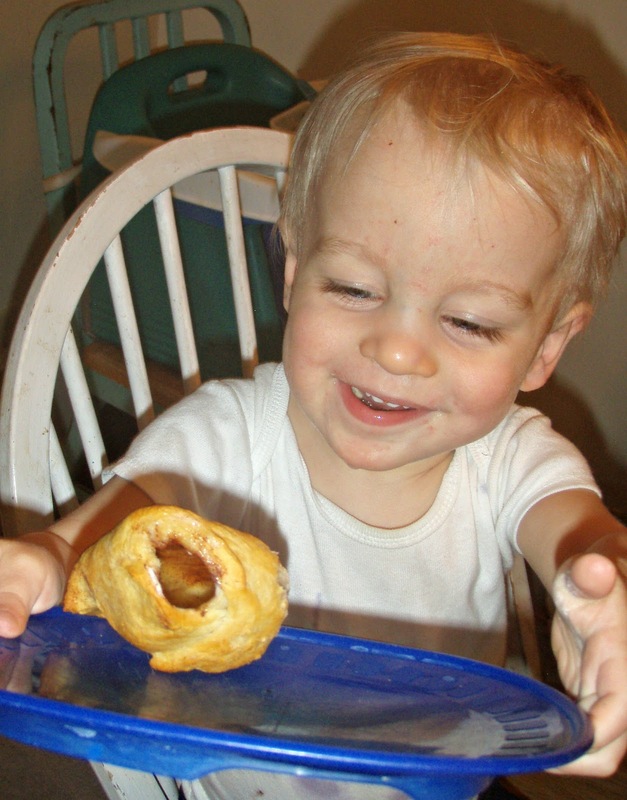 The Donutman song "Shout Hosanna" is also a favorite! I don't personally have a CD with that song, but YouTube has several videos you can play for your kids to dance to. It won't take long to learn any of those songs, even if you just look them up online and play them from your computer. A friend recommended Passion Hymns for a Kids Heard book and CD set to me, and I ordered it for my kids this year. My friend's family listens to the CD and reads the devotionals from the book in the days leading up to Easter for family worship and she has kids spread across quite an age range. I have heard her 4 year old singing hymns while she colors in my preschool class and was impressed how many songs she knew! Kids are like sponges -- why not play hymns for them that they will be singing all their lives? A favorite CD in our house (or I should say our van) is Songs Jesus Said by the Gettys. We have listened to "Christ Has Risen" on that CD on Easter morning for several years now -- it's a great song to get up and dance to in celebration that the Lord is risen! I like quite a few of the other songs as well, even if they are not specifically Easter related because they are about the life of Christ. The other day in the car, after listening to "Once Upon a Boat" 95 times in a row, Susie suddenly piped up "Mommy, I think this song is about the time Jesus fell asleep on the boat and then he woke up and made the storm stop!" HAHA! It was quite the "aha" moment! If we want our children to have the Scriptures imprinted on their hearts, then it is wise to have them "sing the scriptures" as our worship minister Chip Stam used to say. Let me just add a quick word about Scripture memory. Though reciting Bible verses together is not actually singing, you will be surprised how quickly even young children will learn to memorize Bible verses if you take time to teach them. This year I decided to have my kids learn a couple verses from Isaiah 53 and I'm so glad I did! As I mentioned earlier, Chip is still not a huge talker, but he does a fantastic job reciting with us! I use hand motions with our verses just as I do with songs, which helps tremendously. I have been writing the verse of the week (it's been more like half a verse) on a little chalkboard as a decoration in our house, and it helps to remind me to quote the passage with them. We usually practice at lunchtime or any other time I think of it! Of course they cannot quite grasp what they are saying, but the exposure to bigger vocabulary like that is great -- we have talked about the words griefs, sorrow, esteemed, smitten, stricken, afflicted, wounded and transgressions. I do not expect them to totally understand, but I do hope they will one day and that those words and verses will make a precious impact on their hearts. I have been building my kids' collection of Easter books and Christmas books since I had a newborn, adding to the collection each year. I also used to work in a Christian bookstore, and took charge of the children's section there. I will tell you something -- it is MUCH easier to find good Christ centered Christmas books than Easter books. Some Christian books take Christ's death and resurrection too lightly and and some are way too wordy or heavy for young children. But there are really good books out there, and I'm sure there are more I don't even know about! Start your collection now if you haven't before, by adding one or two to your child's Easter basket this year! Here is my list of good choices, broken down into 3 categories: Storybook Bibles, Bible narratives and allegorical tales. God is Great Bible Stories for Toddlers by Carolyn Larson (we wore ours out and I have a new one coming for Chip's Easter basket this year). Big Picture Story Bible by David Helm (we put this one in Susie's Easter basket last year and loved reading it together -- so well done). The Child's Story Bible by Catherine Vos (another older one with very few pictures -- I love the way this is written! We read this to our 4 year old's SS class, but I would typically recommend it for early elementary and up). Christian Focus has a little collection of board books called "Sent to Save" that each focus on how Christ saves his people that are really well done. I don't think anyone does good serious board books like Christian Focus (side note: I also really LOVE their board books about God's character and prayer). They will not have flashy sparkly pictures, but they have very sound content! I would recommend Jesus Helps His People or Jesus Finds His People for your littlest readers this Easter. Bright Easter Day by Julie Steigmeier is my new favorite! I love the realistic illustrations and well written story. Even though it rhymes, it is very true to the Biblical account. The Very First Easter by Paul Maier is still too long for my kids to sit and listen to all at once, but it is top notch for sure. I think this beautiful book holds the bar up high on Bible narrative books -- there just isn't a better one (in my opinion!). R.C. Sproul's children's stories, especially The Prince's Poison Cup and The Priest with Dirty Robes. We don't own these yet -- again, I'm saving them until my kids are old enough to really appreciate them, but they set the bar on allegories. Just like Maier's book on the first Easter, these books are so well written, they can be enjoyed by children of all ages. Well worth the price you'll invest. What are your favorites? Do you have some I haven't yet seen? A couple weeks ago I shared with some ladies at church 4 ways we can make Easter special in our homes so our children know that this is a time of year when we rejoice in our risen Savior. I thought I'd share them here and then discuss them more in detail in the coming days. These ideas are very simple, but can make Easter a big deal for your kids! Working on a painting -- keeping it real with the messy house in the background! 1. Books -- get some really excellent books celebrating Christ's death and resurrection and put them in a special place in your home. I dragged down a large picnic basket to hold mine, and put them out in the living room so they are accessible to my kids all the time, but also have a designated place so it looks nice (our collection of stuffed lambs is in the basket as well). Start now to build your collection by buying 1 or 2 books each year, adding one to each child's Easter basket, or trying to find good titles from your local library (I wouldn't count on just that -- but you can find some!). I gathered together all our storybook Bibles as well so we can read about Jesus' life in each of those, and read and re-read the accounts of the Holy week so that when they know the story very well. Tomorrow I will Here is a post a suggested list of Resurrection titles I like to read for children. 2. Music -- just as Christmas has its carols, worthy of singing because of the great truth and tradition, teach your children songs about Easter! When my daughter was not quite 2, we just sang the Gospel song and "Easter Friday" over and over with lots of motions. Now that she is almost 4 we are learning a new song every week this year. I think you have to be a bit more intentional with this, because Easter songs are not marketed and available like Christmas carols, but you can glean wonderful songs from here and there, and play them in your home, sing them before a meal, listen to them in the car. . . my daughter has been known to belt them out in the grocery store. ;) Please comment if you have a favorite Easter song or hymn! I will be posting links Here is a post I wrote about some of ours. This year I received a very special quilt that belonged to my mother that is a gorgeous bright colored antique. I think it will be a part of our Eastertime decor every year from now on as it was the quilt that we draped on my mother's coffin at her funeral. When I look at it, I remember that we have hope because Jesus crushed death on Easter morning. 4. Traditions -- when it comes to Christmas, we have Christ-centered traditions like crazy! I want Easter to be no less for my kids. So I have been planning certain foods we make each year, certain activities and outings and crafts. You certainly don't have to do everything, but if you choose a few things and do them well, and intentionally, it will become a tradition your kids look forward to each year! I will be posting more about activities we enjoy doing in the coming days, but for now, I will link my posts from past years if you are interested in reading what we have done in the past. This year is much easier because I am really just re-doing what I have done before with a couple of additions! That's one bonus about traditions! 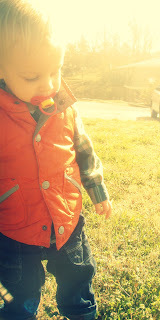 It's about time I write on my blog! I have left it dormant for so long because I felt like it was an easy thing to let go, and then I felt sheepish about picking it back up again. Well, I can't promise I'll post consistently, but I can at least make the effort to do a bit, and I have in mind a little series I'll post about what we are doing in preparation for Easter (so hopefully we'll get at least that far!). 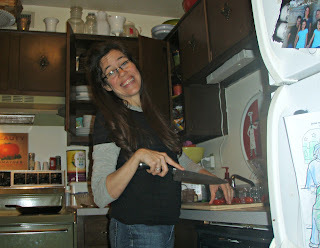 But for starters, I just wanted to post this picture of myself my 3 year old daughter took last night while I was making dinner. Maybe it doesn't blow you away, but I really liked it. Not only did she center it somewhat and not make me look like I have more chins than I do, she captured me in the middle of my small messy kitchen finishing supper preparations. I did not have a picture like this of myself (before now) and do not have anything like this of my mom. But I sure remember what she looked like in her kitchen. 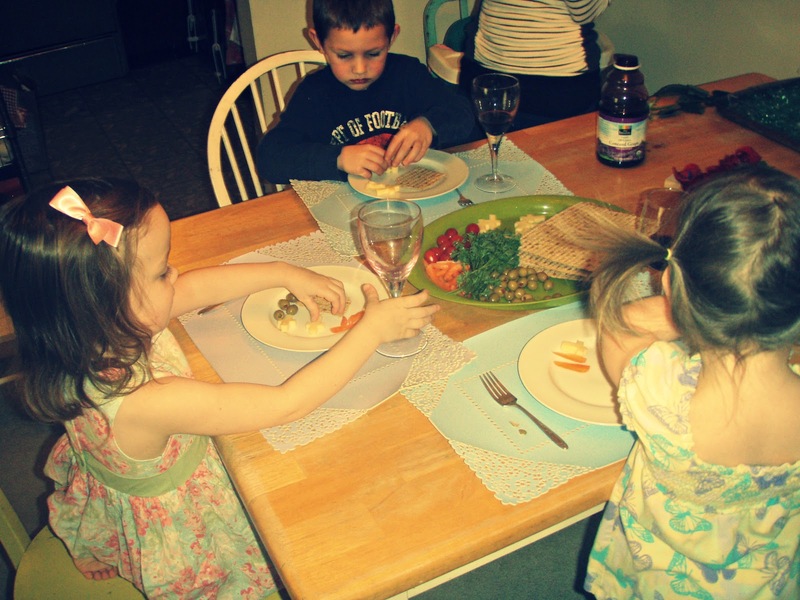 Day after day, night after night -- there was a meal on the table for our family. We thanked Jesus for it, but otherwise mostly took it for granted -- Mom had done that work for us, AGAIN. I liked getting a chance to see what my kids see. I hope they see me the way I look here -- busy but HAPPY about my job!